Now that we've passed Black Friday & Cyber Monday, the holiday season is quickly approaching. The holidays are always busy for me - how do I fit in time to see the important people in my life? While chaotic and stressful, I appreciate and enjoy the time I get to spend at home with loved ones. The Tactical Rope Dispenser was created to have usable, tangle-free paracord at any given moment. 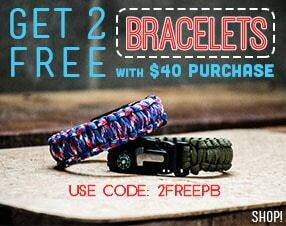 Holds 50 feet of paracord (included) and is convenient for any survival, emergency, or outdoor situation. The built in belt clip and cutter is convenient will quickly become a favorite of Dad's! Does your Dad spend a lot of time in his workshop? Get him this electric hot knife to mount on his workbench. This tool makes cutting paracord a BREEZE! The hot knife can slice through many types of rope, cord, paracord, nylon, and more in mere seconds. Designed to cut and seal the ends of cord at the same time, this tool is a must-have for any workshop or garage. Does Mom have a favorite bracelet or necklace she wears all the time? Pick up a charm or two to show her how much you care and as a way to remind her of you. Pick up a finished snap charm bracelet for Mom or get matching ones for the whole family! We also have an entire selection of snap charms to mix and match on our bracelets! Pick up this book for the crafty kid in your life. Each craft has full-color step by step instructions for 12 animal shaped knots and ties. We have a wide selection of crafting books, check them all out here. Keep the kids entertained for hours with our DIY crafting kits. Each kit comes with a selection of paracord, buckles, charms and more! If you'd rather give a handmade gift, these tutorials will make awesome gifts for anyone! As a thank you for reading our Holiday Gift Guide blog, use coupon code "HGGB20" to take 20% off your order now through 12/3/17 at 11:59pm CST! What is on your gift list this year? 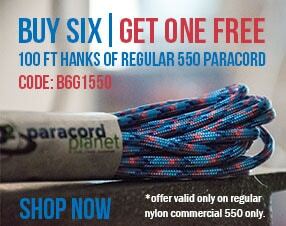 How do you give paracord to those you love? Let us know by sharing pictures with on our Facebook, Twitter, Instagram, Pinterest, Youtube, and Google+!